subroutine You and the Runner secretly spend 0credit, 1credit or 2credit. Reveal spent credits. If you and the Runner spend a different number of credits, do 2 net damage; otherwise do 1 net damage. Trash Mganga. Is Mganga trashed when the Corp and the Runner spend the same number of credits or a different number of credits? requires only 1-2 credits to use, 1 net damage could mean the differences between a painful Snare! and a deadly one. Overall a replacement for the now rotated Data Mine, might be worth a look in some AgInfusion: New Miracles for a New World or Jinteki: Potential Unleashed decks. 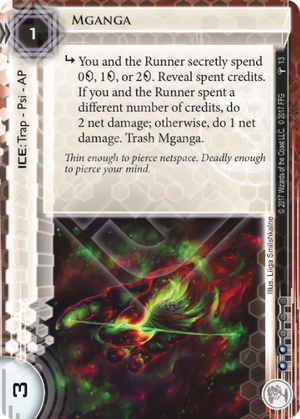 I see some use for this in a Chronos Protocol deck, provided you draw it early enough. If you draw it early it has a good potential to snipe a key card from the runner's hand, even if you're otherwise low on credits. Later in the game the effect will be smaller as the runner will mostly have set up their tools and the chance of an AI being out is higher. A more subtle use of Mganga can be to trick the user into getting their AI breaker on the board and then using cards that are worse when there's an AI breaker such as Chiyashi. However, this is something which works with other traps such as Whirlpool as well and I'd rate Whirlpool higher in terms of scariness (with Mganga you know what you could get, with Whirlpool there's the potential of running into some deep nasty traps with no way out). On the other hand Mganga is reliable, it doesn't need a server with ice behind it and/or facedown cards inside it to be scary.